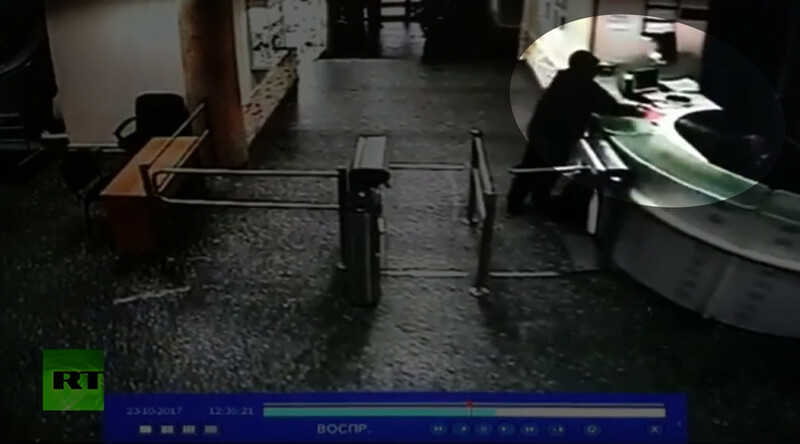 CCTV footage has emerged showing the moment that a knife-wielding man entered a Moscow radio station after pepper-spraying a security guard. He then went on to stab a journalist in the neck. The video shows attacker Boris Grits dressed completely in black as he enters the building of Echo of Moscow radio station in the capital. He approaches a security guard who is sitting behind a desk. Grits distracts the official by handing him some paperwork before pepper-spraying him in the eyes. The knifeman then slides underneath a metal turnstile and proceeds to enter the building. After gaining entry, Grits went on to stab journalist Tatiana Felgengauer in the neck. She was taken to hospital where she underwent surgery. Felgengauer is in a serious-but-stable condition following the attack. Initial media reports stating that she had been placed in a medically induced coma were incorrect, according to the director of the Sklifosovsky Research Institute, Sergey Petrykov, as cited by TASS. Grits - a dual national of Russia and Israel - was placed under arrest, an investigator said on Tuesday. Grits has pleaded guilty to harming Felgengauer, but said he had no intention of killing her, according to the investigator.